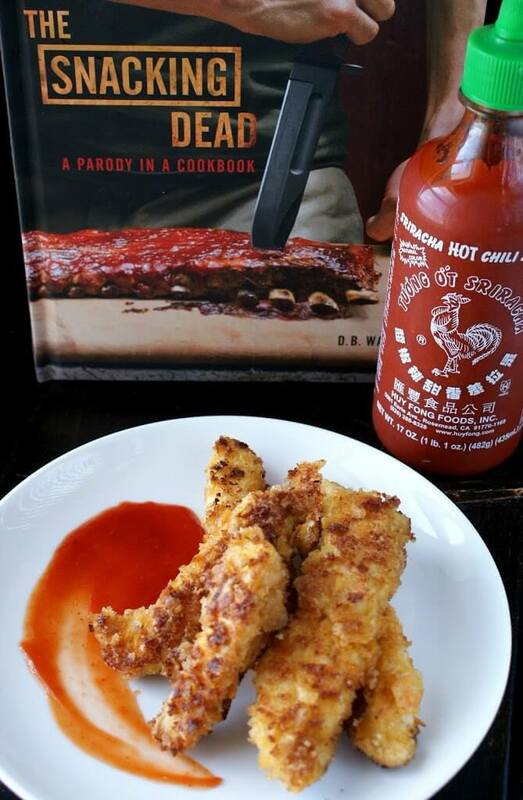 This past Christmas we got this awesome cookbook called The Snacking Dead from my uncle. As Walking Dead fans we were super excited to try out some of these recipes! This past weekend we finally had the opportunity to do so, and needless to say, we’re pretty much in love with this cookbook. Everything looks so delicious and the parody that goes along with the recipes is quite entertaining too! Where all the people are at Terminus? Who’s going to die? Where the heck is Beth? Has Daryl gone back to his old ways, or is he still the man we all know and love? I’m hoping we’ll get a little insight during this season’s finale and I’m sure it’s going to be action packed because last week’s episode was a happy one. But anyways back to the food! The first dish we made were these Nail-Biter Chicken Fingers, they were awesome and will probably be made weekly in our house. 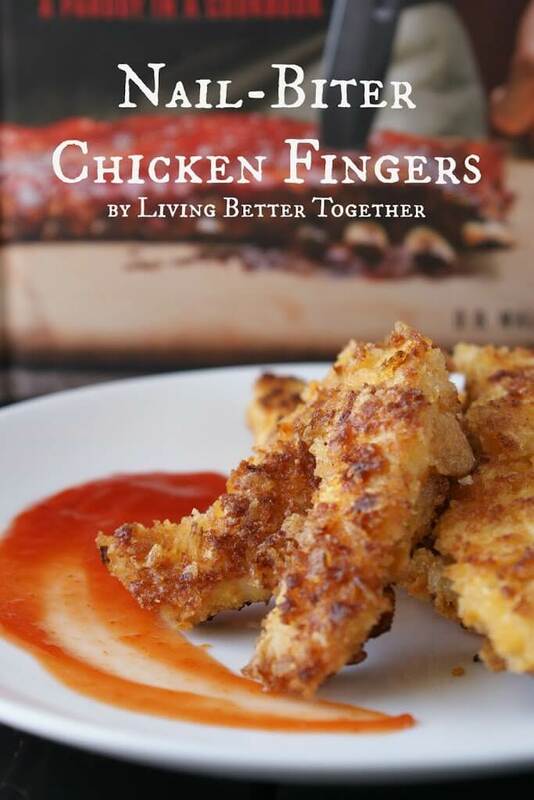 These chicken fingers are breaded in honey barbecue potato chips and panko bread crumbs, pan fried and then dipped in a sriracha ketchup to finish them off. 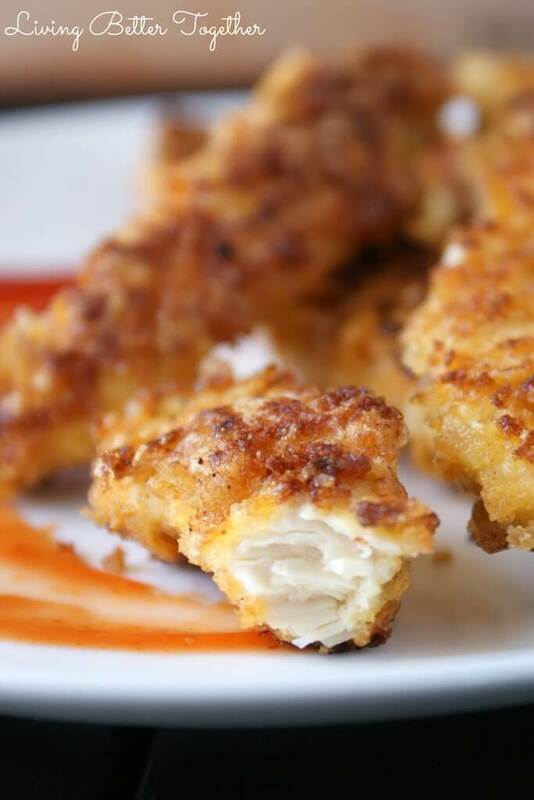 They’re so moist and flavorful and the breading is the perfect amount of crunch! They’re super easy to make too – as in ready in less than 30 minutes – easy. What’s not to love! Stay tuned for another fun Walking Dead recipe on Sunday! I love this cookbook so much, I want to give one of you your very own copy! Cut chicken breasts into strips approximately 1/2 inch wide. Season strips liberally with salt and pepper. Add flour to a medium bowl, eggs to another medium bowl, and the panko and potato chips wish a dash of salt and pepper in another medium bowl. Dip each strip in the flour, shake off the excess, dip in eggs, and then dip in the potato chip mix, turning to coat completely. Place one a baking sheet until ready to cook. Place a large skillet over medium-high heat and add about 2 tbsp of vegetable oil. Once the oil is simmering add some of the chicken strips to the pan, do not overcrowd. Sear without moving until the chicken fingers are golden brown and then flip to cook other side. It took about 3-4 minutes to cook each side. Once fingers are done cooking transfer to a paper towel-lined plate. Continue cooking the rest of the chicken fingers until they are all done, but sure to add more oil as needed. 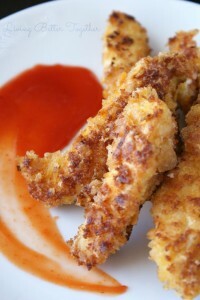 Combine ketchup and sriracha in and bowl and serve with hot chicken fingers.